After Manny Pacquiao was upset by Jeff Horn on July 1st in Australia for his WBO welterweight title, his promoter Bob Arum of Top Rank had hoped to stage a fall rematch between the two back 'Down Under' but Pacquiao had reservations about facing Horn again in Australia. 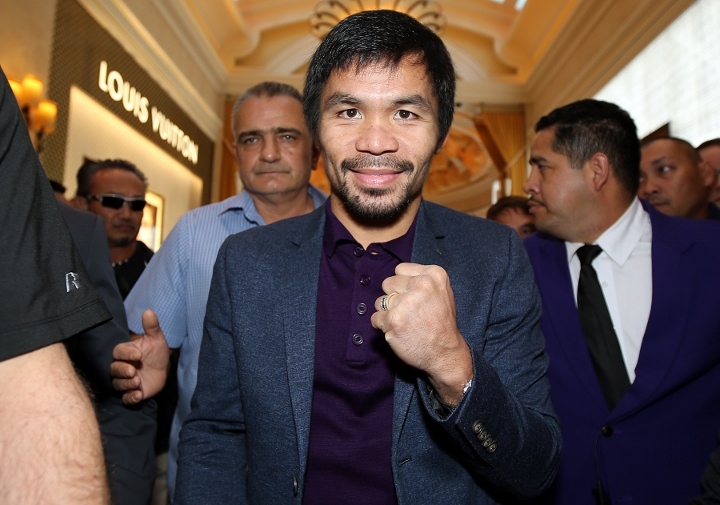 Now, the veteran promoter wonders if Pacquiao will ever return to the ring. "Manny is being groomed to be the president of the Philippines. He's a full-time senator, I mean, in Manny's world he's not a full-time boxer and therefore, I offered him the fight with Jeff Horn in Brisbane, the rematch, and he's not willing to go to Brisbane," said Arum in a recent interview with BoxingScene.com. Arum continued - "I don't know if or when Manny will fight again but I know that the reason for his disinterest in boxing is because he's devoting himself really, really full-time to his duties as a senator." Horn is now scheduled to face Gary Corcoran in his first title defense (https://www.boxingscene.com/jeff-horn-vs-gary-corcoran-terms-agreed-november-bout--121049) and Arum has talked openly of Terrence Crawford - who vacated all his titles at junior welterweight - facing Horn in 2018. Pacquiao retired for a brief period last April, after winning his trilogy fight with Timothy Bradley at the MGM Grand in Las Vegas. But after securing his senatorial seat back home, it didn't long before Pacquiao announced his return to ring - which took place last November when he came back and decisioned Jessie Vargas to capture the WBO title at the Thomas & Mack Center. Should Pacquiao walk away from the sport at the age of 38, he will leave with a final mark of 59-7-2 (38 KO's) and a career where he won various titles in various weight classes ranging from flyweight to welterweight. Pacquaio is probably sick of Bobfather telling him what to do. He tried making the Khan fight, though, probably just to get away with Bobfather's clutches. Pacquiao needs to get his last fight with anyone not named Bob Arum. He already lost his Nike sponsorship, he doesn't need Arum & Koncz touching his wallet again. This thread should be in the pinoy lounge! Boprum wonders if he can Rob Manny in another fight I hope Manny retires for good.